Raise your hand if you just want to bypass spring and head right into summer?! :: raises hand :: Yup! This girl right here just wants to already get rid of all the snow that's hanging out here in the Chicago area and get right to the bright sunshine, blue skies and 80 degree weather! So, I thought why not get a jump start and share a few of my summer favorites that I hit execute on the cart and can't wait for these goodies to get here! Some are on SUPER sale right now that I had to snag while others like those adorable sandals are going to be coming in a few weeks. I mean, I can't say no to gold and pink right?! 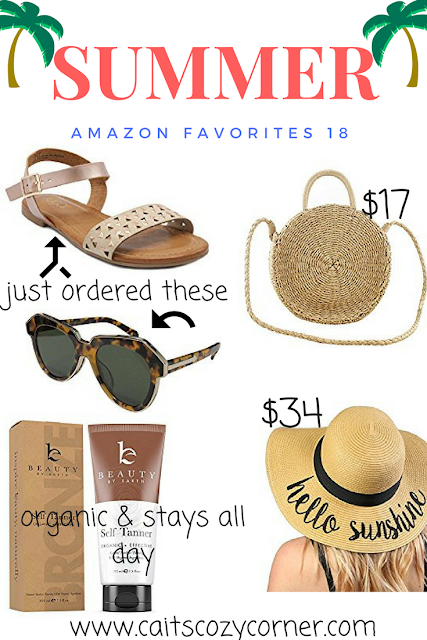 Alright check out all my favorites that Amazon has going on and tell me what you're super excited for summer! Are you anxious to try out a new sun tan lotion? What about the cutest straw hat?! I can't wait to hear!